Back story: Since I am the one who has had to deal with cats peeing/pooping in the wrong places in the past, I am currently on it to prevent such occurrences in the future. 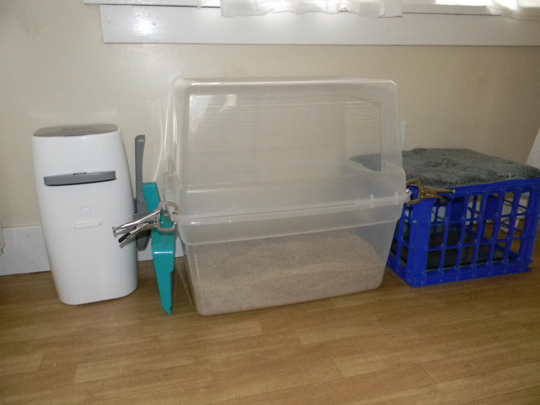 One part of the plan is having litterboxes on all levels of the house. Mock me if you must, but you haven’t wept as you’ve ripped out carpet and discovered horrific damage to sub-floors. Current problem: We have raised cats who are not afraid of water (see squirrel-monkey post), and the two boys like to get in the shower with you. (Well, not you, but whoever is in the shower.) 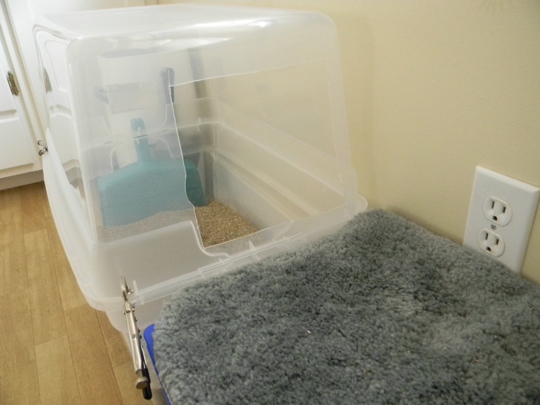 Then they go into the litter box with their wet paws and make a mess. Awesome. 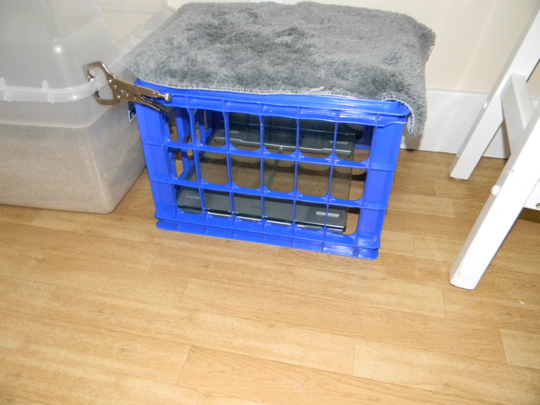 ‘Solution!’: A milk crate from the basement, a tub and rug from Walmart, and mini-clamps from Harbor Freight. 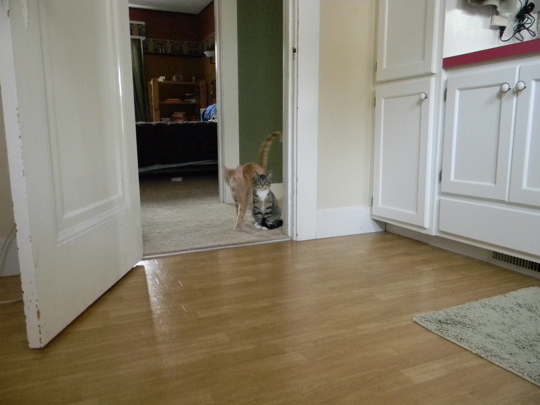 They have to jump on the rug to go in and out, so their paws dry off. The rug also catches most of the litter when they come out. I like the milk crate because I can put the scale underneath. I like keeping track of Sarge/Ralph. He is going to be a monster. They are only 4 1/2 months old but he’s already nearly 7 1/2 pounds. Hooray! I’m going to have my own tiger!! These kitten posts make me waffle between wanting to adopt a kitten immediately and vowing never to own a pet again. Brilliant prototype though, Lauren! I suggested super gluing the tubs together, but Lauren wanted to be able to scoop the poops (as it were). Lauren, your problem-solving amazes me! That’s a clever solution. It should also help contain any stinkiness. Lauren you are a genius!!!! When your kittens are “full grown” you’ll need to address him with Sargent Ralph Sir! I can’t wait to see this guy in person.